NFB 76/77 Olympische Spiele Munch.. John Whitney’s 19..
Beck’s diagram is indeed a work of genius, so it’s shame that you’ve linked to the 1960 diagram, which wasn’t by him at all. As the excellent books on the diagram (Mr Beck’s Underground Map and Underground Maps after Beck) describe, Beck was unceremoniously relieved of design duties, and the 1960 diagram – by Harold F Hutchinson – shows what a mess the replacement was. It’s angular, losing the subtle but important Beck curves, and the compression around Aldgate requires splitting a name in half. This is probably the sign of an obsessive, but that diagram is as different to a Beck diagram as the Vignelli NY map is from the non-diagrammatic map it replaced (and, sadly, was succeeded by). Beck never designed the diagram officially again, but the replacement map by Garbutt set up the evolutionary chain that’s led to the current diagram (which I dislike; it’s taken on too much clutter with its disabled access information). If you’re going to link to a Beck diagram, I’d suggest his original, the 1933 map. Thanks for the heads up paul….updated. Guess I wasn’t paying very close attention when I linked up that example. If you haven’t seen it, check out Vignelli speaking about the map in an outtake on the helvetica film website. Vignelli’s map is much maligned, perhaps it could have been better. It is the culmination of a horrible sequence of design steps, which have unfairly led to the demise of diagrammatic maps of the New York Subway. George Salomon created the first diagrammatic map of the NY Subway in 1959. Not as good as he wanted, the reactionary NYCTA wanted the map colour-coded by historic ownership (IRT, BMT, IND) rather than where the routes actually went. Nonetheless, it has an elegance that would be expected from a designer who worshiped Henry Beck. 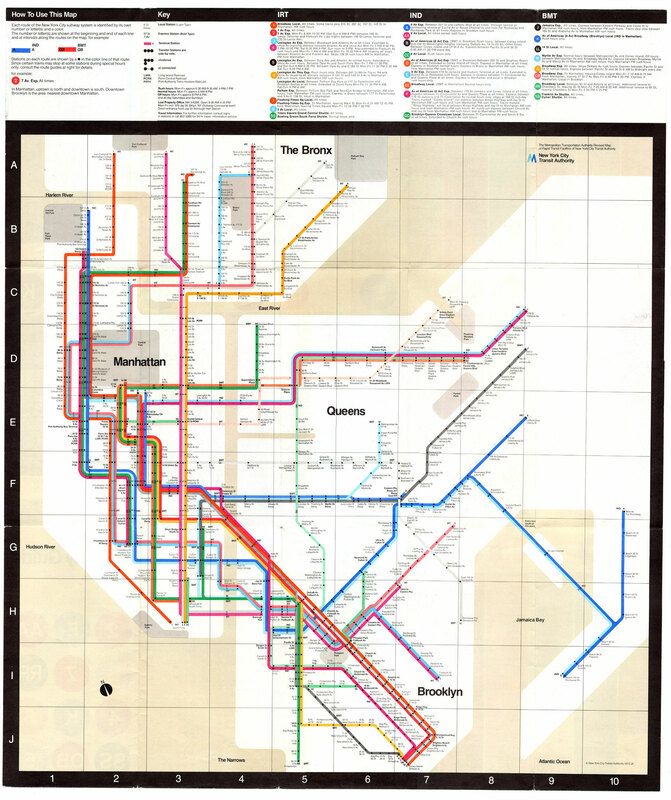 When the Chrystie St connection opened in the 1960s, the upheaval to services was so immense that NYCTA decided to show individual routes on the map, a unique colour/pattern for each one, George Salomon’s design was ruined. 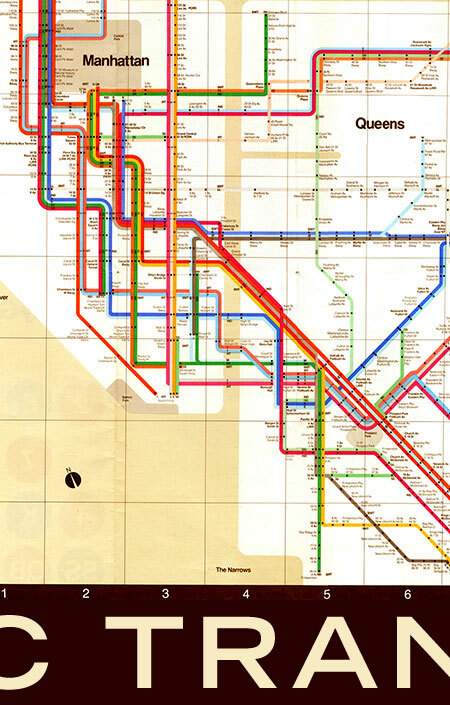 Vignelli essentially cleaned up this disaster, but all those individual colour stripes (one for every single route) were impossible to show well, the colour destructured the map. Add to this the problem that not all routes ran at all times, but these were undifferentiated on the map (you had to refer to the small print on a key to find out what ran when). You have to separate the style (diagrammatic, geographical, pseudo-geographical) from the implementation. One colour for every single route would ruin all possible maps, including today’s NY Subway map. Put it simply, Vignelli’s map was rejected by New Yorkers for complicated reasons, not necessarily lack of geographical accuracy. This is merely an easy obvious target.